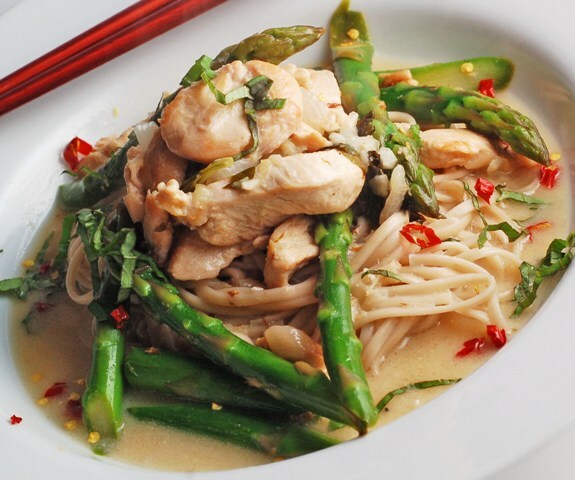 A simple Thai inspired chicken recipe with asparagus that is seasoned with a light coconut broth with hints of ginger, chilies, basil, and lime. To serve ladle it over a bed of noodles. As we mentioned in our podcast last night this week is all about using what we have on hand for dinner. I always love when it comes down to this as it forces me to be creative with what we have on hand. As well it is always nice to start out the next shopping spree with a clean fridge, freezer, and cupboard! Tonight I decided to use one chicken breast, some asparagus, and udon noodles. As well I wanted something spicy. I created a broth by using shallots, garlic, chilies, fresh ginger, lime, and lite coconut milk. The broth was so fragrant while it simmered but I knew it was missing something so I scoured the fridge and found some basil, in it went. Within a few minutes, the aromas were definitely headed in the right direction, it reminded me of walking through a dusty village in Bangkok. I sauteed the chicken until it was golden and then the asparagus just until they were warm and still crisp. While the asparagus was cooking I made the noodles and added the chicken to the broth so it could come together and form a perfect harmony. It was really fantastic smelling by now and I could not keep my tasting spoon from constant sampling. To serve I put a bed of noodles in a shallow bowl and topped with the broth of chicken and asparagus. A very light dinner that was spicy on your tongue at the very first bite but cooled down once the lime followed onto our taste buds – the perfect marriage. Add shallots, cook until soft. Add the garlic, chilies, and ginger, cook until lightly golden but not crisp. Add the lime juice. Remove from the mixture from the saucepan and put into a small bowl, set aside. Add the chicken to the saucepan and cook until golden in color. Remove to the small bowl with the garlic mixture. Add the asparagus to the saucepan and sprinkle lightly with a couple tablespoons of water, cover and let cook for about 3 – 5 minutes, just until warmed through and still crunchy. Remove from the heat and set aside on a plate. Return the chicken and garlic mixture to the saucepan and add the coconut milk. Bring to a simmer and then lower the heat. Boil the water and then add the udon noodles, cook for about 5 – 6 minutes, drain. To serve put a layer of noodles in a shallow bowl, top with the asparagus and then pour over the chicken broth. Garnish with thinly sliced basil and chilies. 5 Responses to "Thai inspired Chicken"
This sounds really delicious. I made a Cold Sesame Noodle dish last night...I love anything with peanut butter and/or coconut. Yum! I will be bookmarking this page, I really want to try this! The Thai flavors sound so wonderful in this dish! And the picture is just gorgeous! Love the ginger and coconut milk! Mmmmm, tasty tasty. I soooo love Thai food, but have yet to be successful at making it at home. This recipe looks like great! I will have to try it out! Thanks for sharing :) Great pic!